This page is still a work in progress, but it will give you an idea of what I will be offering here and soon. Below is a list of prints that are available, along with a brief description of each painting. Sizes, pricing and shipping info are at the bottom of the page. I will be using Paypal for all credit card transactions and hope to have it set up here soon. For now, If you would like to purchase any of my art, you can mail your payment to me in the form of a check or money order. Please contact me at the email address below for shipping cost and where to send your payment. Thank You for your patient. Please Note. My originals are not for sale at this time! Click on the pitures below to view a larger image. My idea for this piece came from a simple 3" X 5" sketch I did at work one day. Kohola is Hawaiian for Humpback Whale. I love Hawaii, the animals and just everything about the islands. I am also fascinated with the Polynesian Mariners. Their ability to sail across vast distances without a compass or GPS was amazing. Available in Paper and Canvas Giclee. I did this painting from a picture I took at the beach on Christmas Eve 2012. These little birds were not vary co-oprative but I was able to get some good shots of them along with some other birds that day. 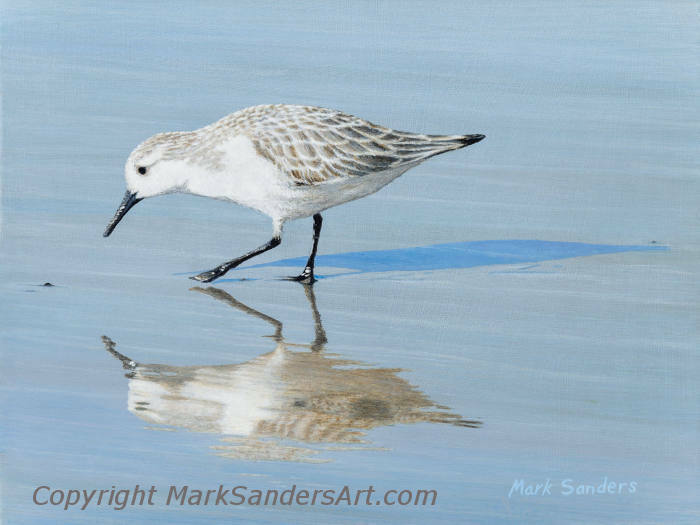 Available in 11" X 14" Paper open edition and 9" X 12" numbered Canvas Giclee prints only. 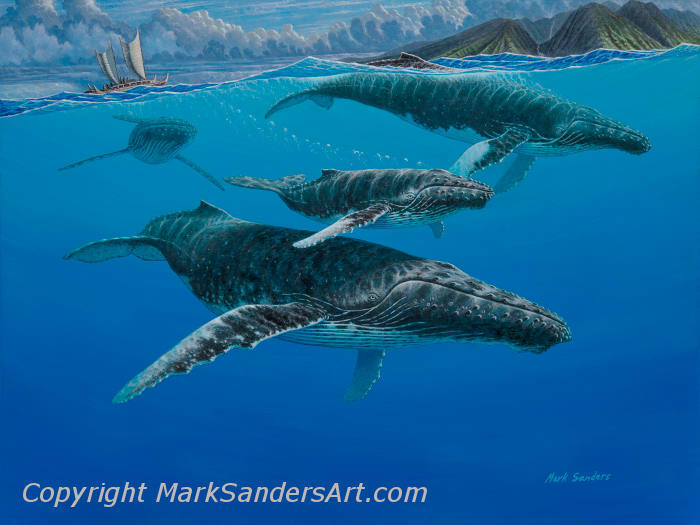 Wile doing some resurch on Humpback whales I came upon a YouTube video that inspiered me to do this painting. Tonga is one of the only places on Earth that you can actualy swim with whales. And yes, it is on my bucket list ot things to do before I die. Prints are not available for this painting at this time. This piece had aquiered some cracks and I am still repairing it. This piece is a compilation of two photos. The background I took wile on vacation in 2008 in New Mexico at a cousins ranch. The bird was taken by wild life photographer Bill Horn Of Oklahoma and used with permission. 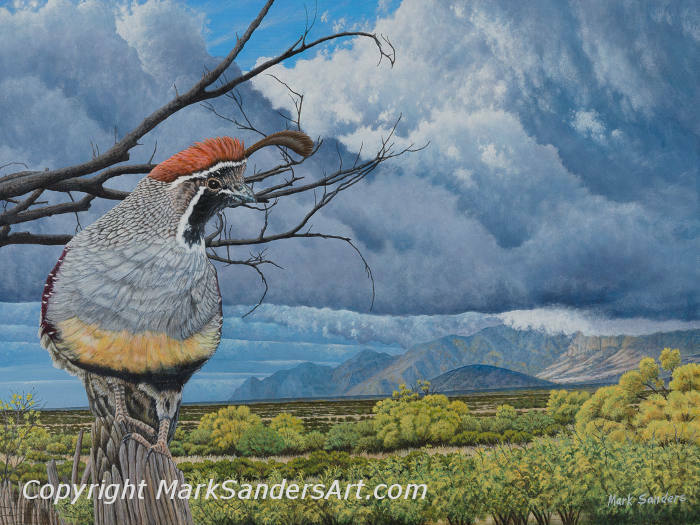 this Painting won first place at the San Diego Co. Fair, Exhibition of Fine Art in 2012. Available in Paper and Canvas Giclee. 2011 was the year I got back to painting on a regular basis. I had gone through some health issues in 2008, along with the loss of my dad in November of 2009 to Alzheimer's disease. I had a burning desire to do something with my artistic abilities. This is a special piece for me. My dad loved Oceanography and it is mainly the reason I did this painting. 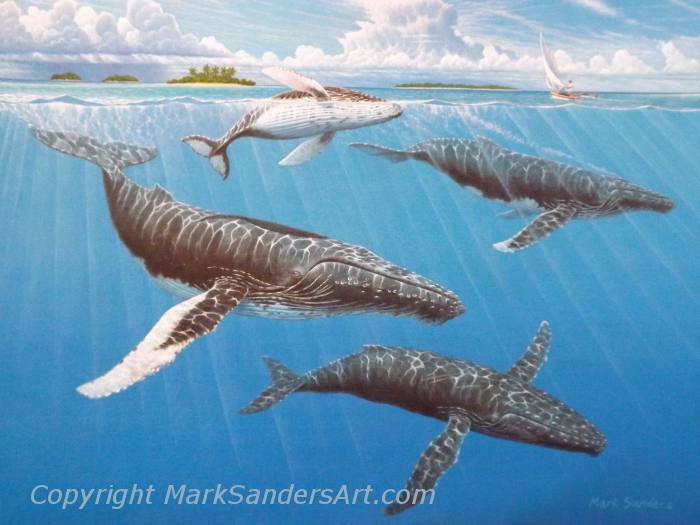 He inspired me to do some whale art back in 1979 but they were copyies of another artist work. It was time to do some of my own. Available in Paper and Canvas Giclee. 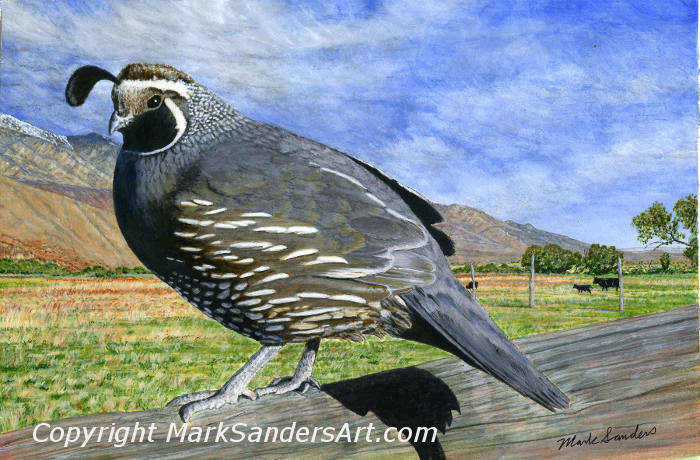 In 2004 a cousin of mine asked me if I would be interested in doing a painting for a Quails Unlimited auction that she and her husband were involved with. It was a time when I thought about persuing art as a full time job but didn't. The back ground is a picture that she took of Lone Pine CA were they live. The bird is from the USGS site and was taken by Andrew Wilson. Available in 11" X 14" Paper prints only. All paper prints are unmatted and do not come with a frame. They are open addition only, except for California Quail. All Giclees Canvas Prints are gallery rapped with 1.5" bars and have the image mirorred on all four sides. They are printed using archivel inks and clear coated to protect them to last up to 100 years under the right conditions. 18" X 24" prints are signed and numbered, limited edition of 100ea. All other sizes are open addition unless otherwise specified. Note Cards - Coming soon! I am also working on offering 5" X 7" note cards of all my art. 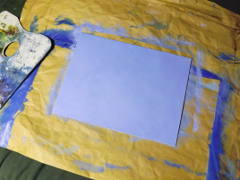 They will come with a plain white envelope and be offered individually or in sets of five. Sets of five can be mixed or matched if desired. Shippments will be made using either USPS or Fedex Home delivery. Which ever is more appropriate. For shippments outside of the US, please contact me for shipping cost. Please alow 7 - 10 days for processing of your order, especially for Giclee Canvas Prints. These are hand made and requier at least a week to make. All merchandize must be returned within 7 days of receipt and be in new condition in order to receive a full refund. I do not refund shipping cost! It is the responsibility of the customer to pay for the cost of Return Shipping and to Insure the item in order to return it for any refund, unless other arrangements have been made. I use safe and secure Paypal. Paypal excepts most major credit and debit cards. As well as electronic checks also. None of your credit card information is ever shared with me. If you do not have a Paypal account, Don't worry, When checking out just click on guest. Just completed another painting and will have more about on my blog soon. If you have any questions about buying prints or my art. Email me at the address below.